In 1957, three new designs for single engine biplanes featured on the cover of the EAA's magazine, 'Experimenter.' They were the Mong Sport, the Smith Miniplane and George W. Meyer's Little Toot. Little Toot was named after the tugboat that liked doing figure eights in a Disney movie of the time. 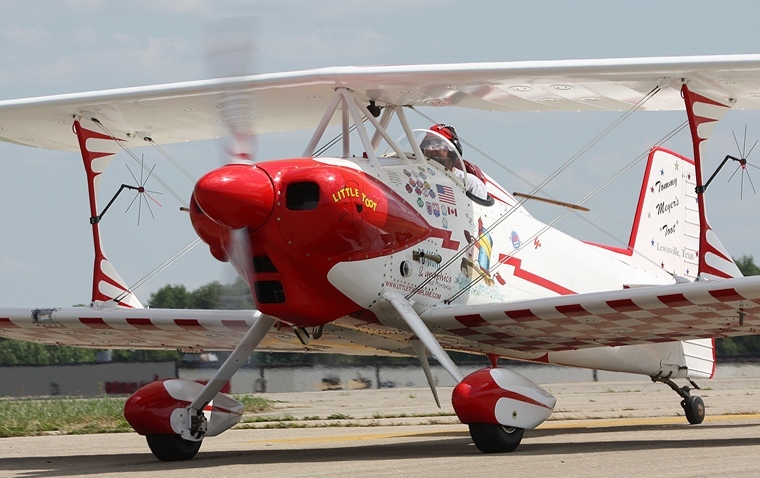 George, one of the earliest members of the EAA was born in St Louis in 1916 and was 41 when he had started the design of the Little Toot in 1954. In earlier years he was an expert builder of and competitor in Radio Controlled models before working for Curtiss Wright. At the start of WWII he joined the US Navy's Aircraft Overhaul and Repair Centre eventually leaving the service as Chief of Fabrication. Bi-planes were the real aircraft of the time and George always had a dream of building an open cockpit of his own design. He decided that his Little Toot would feature the best of the great bi-planes of the time. George started by drawing a full set of plans and then his previous experience in RC modelling stood him in good stead. He built a fully detailed half inch to the foot model including a scaled down metal copy of a Continental C-90 engine. George started his full scale project by building the welded steel tubing frame and installing the engine. The tail section came from a Luscombe8A and the whole fuselage was covered with aluminium sheeting. The only fabric covered surfaces were the Spruce spar wings and ailerons. The upper wing is swept back at eight degrees; the lower has 2.5 degrees dihedral with almost full length ailerons. The landing gear and wheel spats were sourced from a Cessna 140. Designed with aerobatics in mind the Little Toot was stressed for 10+/- loads. 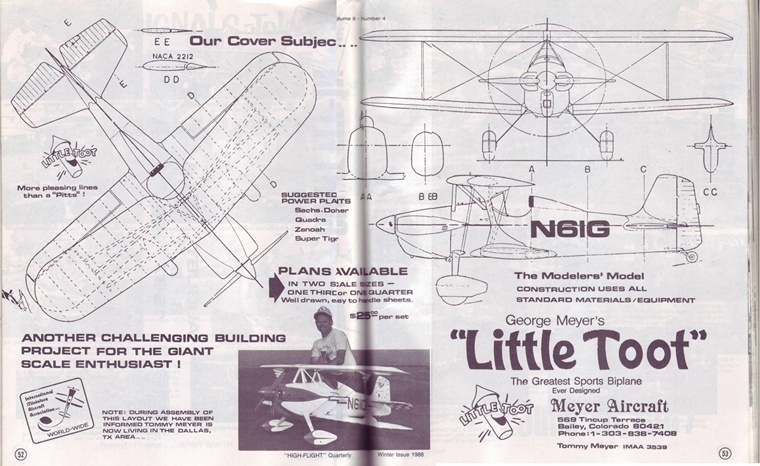 Little Toot was completed in 1957 and by that time George had learned to fly in a Cessna 140. 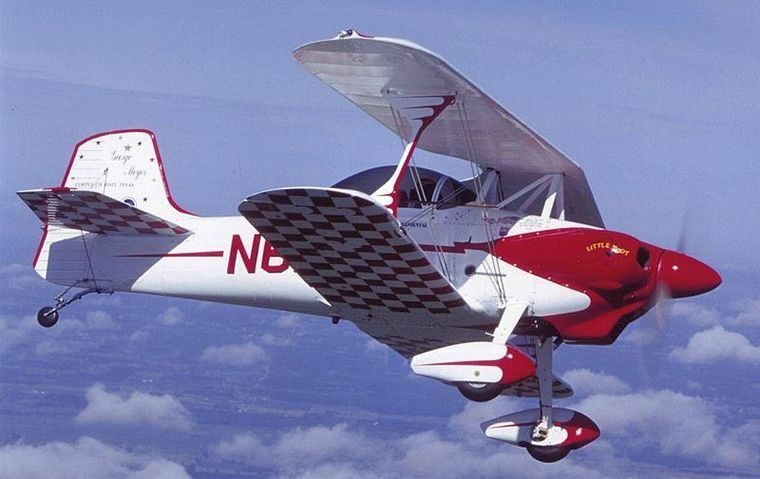 A family friend, Pauline Gleason test flew the Little Toot whilst her husband took it through its first aerobatic sequences. The Little Toot flew like a dream, only minor tweaking was needed. The first prototype was displayed at the EAA's convention in 1957 and walked away the Mechanix Illustrated Trophy for Outstanding Achievement and was placed second in the Outstanding Design category.